What is broadcast automation and why is it important to me? Broadcasters and media operations face the complex task of managing all kinds of hardware and software, such as switchers, video servers, graphics systems, routers, newsroom systems, craft editors (NLEs), VTRs, tape formats and file codecs. Broadcast automation manages these complexities resulting in collaboration, creativity, efficiency and immediacy four keys to innovation. Broadcast automation enables users to control important steps of story creation and distribution. 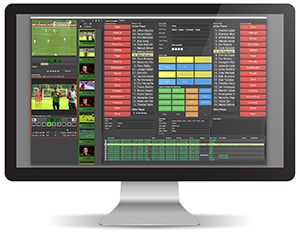 Having an open-architecture, client-server, script-based system is essential when it comes to broadcast automation software, especially when it comes to Media Asset Management. Broadcasters are creating and distributing an ever-increasing array of content to an every-increasing spectrum of platforms. One two-minute segment will end up as part of an evening news broadcast as a stand-alone piece available on the Internet and as archived content that will be accessed in 10,000 search engine results. Primestreams FORK lets you manage all this simply and efficiently. I have a lot of other gear in my facility¦will it all work within a given automation environment? The same characteristics that make FORK the most comprehensive solution, also make it the most flexible. FORK can control almost everything, precisely because it is versatile enough to embrace anything hardware from all major manufacturers, all major tape and digital formats and both Mac and PC environments. A broadcast automation platform that plays well with a vast assortment of other broadcast hardware and software is crucial to the success of an operation. For example, some facilities today are using various Non-Linear Editing solutions such as Adobe Premiere Pro, Avid Media Composer and Apple Final Cut Pro instead of just one editing platform. The ability to integrate with all three allows editors to work collaboratively and across NLE platforms. This allows facilities to deploy workflows strategically across departments. What about logging? Its tedious and inaccurate. What options are available? Logging live or recorded content with metadata is one of the most painful, yet vital, of all broadcast tasks. If you dont have sufficient metadata attached to your media assets, then finding assets become super tedious resulting in spending more time finding the asset than doing something with it. Primestreams FORK Logger software was designed to address metadata tagging, marker creation and subclips with speed and accuracy. FORK Logger uses pre-built templates that are customized to the programming that you are covering, from sports to reality TV. So during a football match as an example, rather than typing in #42, corner kick, #7, header, goal tapping 5 buttons via touchscreen display or regular mouse, would accomplish the same thing and provide the rich metadata that is needed to later have the ability to monetise the assets. This presents an opportunity for content owners to digitize content for many creative uses. A brand like Nike can digitize its history, then later launch its own online channel with live and/or OnDemand content that can be search and organized by category. What if I want to access my MAM remotely? If you can access a computer, you can access Primestreams FORK MAM, and if you're in FORK, you can control your entire operation. You can ingest, archive, edit, and play out media all from within the FORK environment. The ability to get at your media from anywhere is a huge advantage and can dramatically speed up production and edit times both for content creation and for collaborative editing and approvals. Xchange Suite gives broadcasters instant access to content on their FORK Production servers from any Windows®, Mac®, or tablet device. FORK Xchange 3.0 allows for remote MAM access, as well as uploading source material to FORK and downloading of source material for local editing. This ability to take work offline on an iPad, laptop or desktop is important for users who find themselves on an airplane or remote location with no Internet. Accessing a MAM remotely is even more vital when concurrent users in multisite production operations are working collaboratively with content. What should I think about when planning an archive for my media? Designing an archive is not a trivial matter and many broadcasters are at a tipping point where they have massive tape libraries that are in danger of becoming damaged because of the inherent instability of the tape medium. In these cases, the first step becomes digitisation. Much of this process can be automated but while the process is happening, it is a good idea to QC the content to be sure it has rich metadata attached and that closed caption files are intact. Once ingested, you need a plan that will insure against that worse case scenario. For example, where huge amounts of assets are lost and the archive is needed for disaster recovery. The FORK Archive Bridge solution allows for operators to have a greater level of visibility into the workflow and can track the status of all archival requests. Facilities can now archive and restore to and from a single location, minimizing cost for the archival infrastructure. We mentioned NLEs¦what is Edit-while-capture and why do I want it? Speed is everything in news and sports production. Whether digitising one or many sources, there are competitive advantages to be had by the organization that can get the shot and get it to air faster than the others. By integrating fully with the industrys leading editing applications, work happens faster and creativity is not sacrificed for that accessibility.